While LFD already wasn't exactly stratospherically-priced high-end, they still felt the need for a cheaper entry-level line of products, which was born a few years ago now, and christened Mistral. Mistrals mimick the original circuitry of 'real' LFDs, but give in to a few compromises in component choice and overall finish. A strategy that could be effective, when you know that the simulated granite front panels of LFDs can't be cheap. Tested here are the Mistral Linestage and Powerstage, a 50W (line-level) pre/power combination that truly is a downsized LFD LS0/PA0 pairing. Outwardly these units looks very nice, if you ask me and my wife, being of a satin black with a brushed aluminium front panel. With the black metal knobs the overall look is understated, a bit like Classe electronics, or perhaps like some older Rowland stuff. However, I understand that in most other countries the knobs are gold-coloured, making the picture a bit less modest. 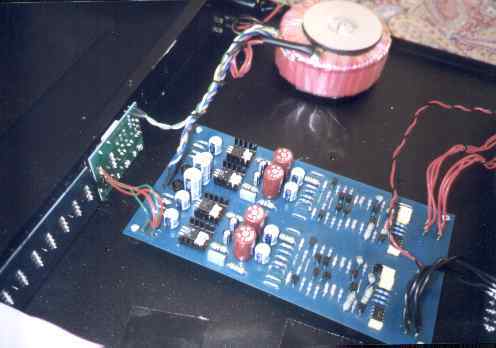 Compared to these economy versions, the LS0/PA0 add a thicker front panel, in simulated granite or in rather flashy Corian, better internal wiring, and perhaps a few more expensive passive components here and there. I slipped both Mistrals into my system, in-between the Rega Planet CD player and the old Quad ESL speakers (incidentally, recent exposure to quite a few super high-end systems have shown me that the Quads still are almost unsurpassable in sheer musicality). From CD to preamp ran an LFD Spirolink IV interconnect, between pre and power it had to be my usual stranded LC-OFC microphone cable job. 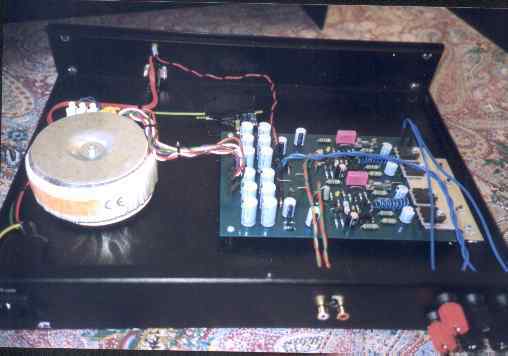 Playing with the ESLs is always a bit of a risk, as their mean and capacitive impedance can be too tough a load for many a reputed amplifier. Not so with the Powerstage. It drove the Quads admirably well, and indeed I would say they were an excellent match for each other! For instance, my stallwart Mary Black CD sounded rhythmic and involving, with a rounded tonal balance that was neither slowed-down nor outright dulled. Quite the contrary: treble was brilliantly clear and exceptionally clean, without going as far as turning glassy. The Mistrals never sounded grainy, never did something wrong to sibilants. The bass was fat and tuneful, not booming along, but just being there and making itself heard. But neither was it very detailed: in fact, it was as if the bass' outer details were there, carrying the tune and the rhythm and the architecture of the music, while some inner detail was missing. Moving up in the spectrum, voices and instruments each had their very own identity, well-articulated in a stable soundstage of perhaps only medium openness, but still with fine width and depth, and with good response to dynamic contrasts. Overall tonal balance was slightly warm, with a creamy and beguiling midband, and something like a patina of tubelike-sound coherently covering everything from the lows to the highs (but certainly without the grunge and lack of transparency of lesser tube designs!). I would describe the Mistrals as eminently colourful, perhaps slightly exaggeratingly so, but with many loudspeakers, or when the alternative is a grey sound, this is to be a good thing. The Cowboy Junkies minimalist The Trinity Sessions showed the airco very clearly far behind Margo Timmins' voice, which in itself was smooth and friendly, lacking any hardness, even during louder parts. One of her musical brothers kicking in with the vocals was rendered with the voices perfectly separated, and if you want a testimony of what these amps can do with faint details, even during complex passages, you should play this disc, concentrating on the drum sounds far away to the right, or listening to the fine harmonics of the cymbals here and there! Perhaps things were a little bit too rounded and softened, but the Mistrals have an overall musicality that pervades the proceedings and makes you want to listen to ever more music. Which is what this is all about, after all. Switching back to my regular pre/power combination of Michell Argo and Quad 306 opened up the soundstage, with a lighter and brighter sound, attacks being more explicit, and with more detail in voices and in the breathy sounds around them. 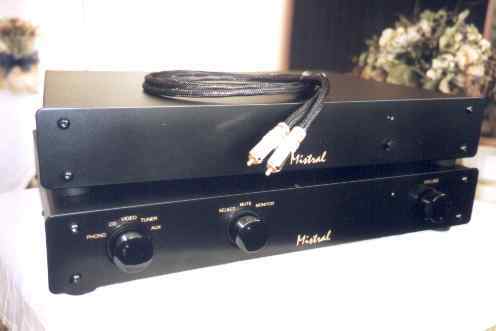 Yet, I feel that in overall quality both amplifier combinations are at the same high level, with the Mistrals giving their enjoyable performance even at very low listening levels, where the Michell/Quad paring can take on a more nervous character. When all is said and done, and trying to be honest, I think I would even prefer the Mistrals over my own amplifiers.